When you have a multiple conditions to be evaluated, it is not always necessary to use the IF function. In this case, it is best to use the search function VLOOKUP. Let’s see how it works. The auxiliary table will contains the beginning points of intervals. Intervals have to be sorted in ascending order. This table can be placed anywhere. VLOOKUP function has 2 variations in finding values. It is to find an exact match and to find the closest match. This behavior affects the last argument Range_Lookup. Lookup_value is cell B2 (value 154). If this value is not in the first column of Table_array, then will VLOOKUP search for the closest lower value. So, it finds value 101 and result is gold member. $ character in the second argument is important, because when you copy this formula, Table_array argument must be still the same. VLOOKUP would not work correctly without the $ character in the second argument. 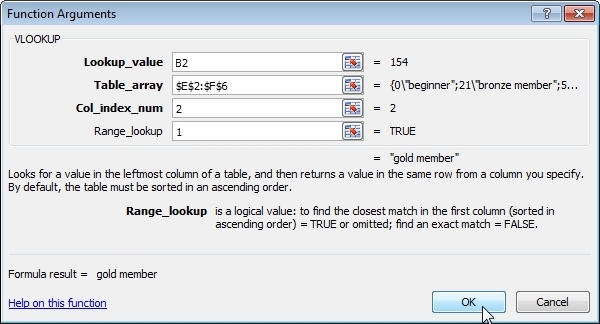 Col_index_num is 2, because Membership column is on the second place in the auxiliary table (in the Table_array). Range_lookup is 1, because we want to find the closest match. Here you can also write the word TRUE. Now copy formula from C2 to other cells. Be careful, this doesn’t work properly! Ex: with 22 it will return the 21 result (bronze) instead of the 51 (silver), because it searches for the ‘nearest’ value. The VLOOKUP starts at the top of the range you specify and looks down (vertically) in each cell to find the value you are looking for (lookup value). It stops searching when it finds a value that is greater than or equal to the lookup value. 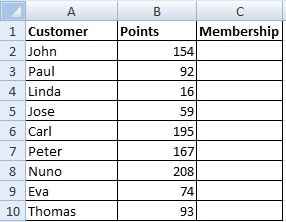 Excel how to choose value from range. Thank you for this solution. it’s very simple. I always wonder how is Excel powerful when you are smart and able to use Excel in the proper way.